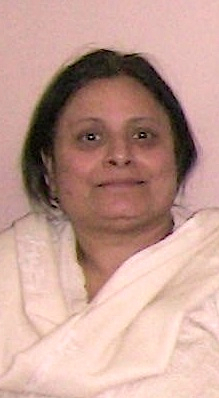 Renu Sethi, born into a lineage of direct disciples of Swami Yogiraj Nanak has been selected by Yogiraj to serve him and the Dhyan Yog ashram at Delhi for the last 15 years of his life. At the request of Yogiraj, a modest quarters was set up at the ashram where her family was able to join her. She has witnessed first hand the grace and magic of serving her Guru so tirelessly and unconditionally over the years. As a result of this intimate relationship with Yogiraj, Renu had the rare privilege of receiving His teachings directly from Him and learning His Dehypnotic Meditation techniques designed by him. After his Mahasamadhi she has worked tirelessly to continue Swamiji�s mission and taken charge and become the principal organizer and supervisor of the Kada Ashram at Allahabad. Kada Ashram, the main headquarters of Baba Maluk Das out of the 108 centers that existed throughout India during his lifetime, is the town where Maluk Das was born and where Yogiraj, has spent numerous years of his sadhak life doing tapasya (penance) and his intensive sadhana. Now with Renu�s experience, love and devotion to her Guru she continues to be guided in keeping the activities and services going at Kada with various programs organized throughout the year including Yoga camps,Guru Purnima, Jayanthi Celebrations for both Maluk das and Yogiraj, Winter charity fund for the poor villagers at Kada and many other events and functions throughout the year.